On October 1, 1982, Walt Disney World’s Epcot Center opened with five Future World pavilions and nine World Showcase Pavilions — Mexico, China, Germany, Italy, American Adventure, Japan, France, United Kingdom, & Canada. Located along the World Showcase Lagoon, the Epcot Mexico Pavilion is full of authentic merchandise, food, and music. Take this fun quiz and test your knowledge of Epcot’s Mexico Pavilion! Test Your Knowledge of the Epcot Mexico Pavilion! The Mexico Pavilion, at Epcot is located between the Norway and what other pavilion? 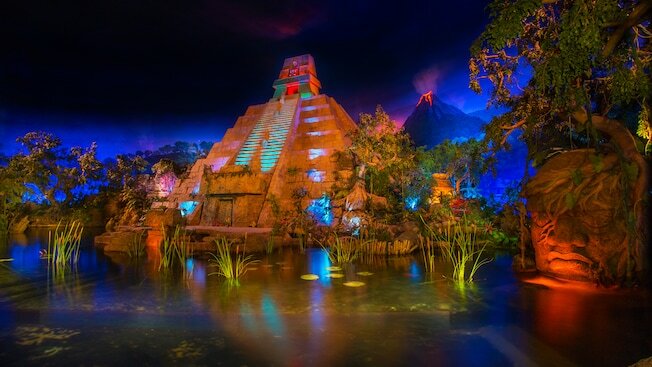 What is the name of the dark boat ride inside of Epcot’s Mexico Pavilion exploring Mexico’s history and scenery? What is the name of the traditional Mexican sit-down table service restaurant inside of the Mexico Pavilion pyramid, modeled after a 17th century hacienda at the base of Mayan ruins? What is the name of the walk-up quick service restaurant in the Mexico Pavilion where you can find delicious Mexican favorites by World Showcase Lagoon—including tacos, empanadas, churros and traditional margaritas? Which Walt Disney character would you find having a meet and greet in the Mexico Pavilion? Which is a popular alcoholic beverage at La Cava del Tequila in the Mexico Pavilion? What is the name of the shop in the Mexico Pavilion that sells fun souvenirs such as fine jewelry, tooled leather goods and colorful accessories inspired by the charm and beauty of old Mexico? Which delicious food item would you find on the La Hacienda de San Angel menu in the Mexico Pavilion? What is the name of Mariache Band which performs traditional music in the Mexico Pavilion? What was the original name of the boat ride inside of the Mexico Pavilion that later reopened after reimagination as the Gran Fiesta Tour Starring the Three Caballeros! Leaderboard: Test Your Knowledge of the Epcot Mexico Pavilion! Good quiz! but boooo!!! I did real bad! You’re more than welcome! I’m glad you enjoyed it!!! I did better on this than others, probably because I love the Mexican pavilion. Awesome score! You did great! My favorite pavillion by far!